Hedab Tarifi was born in Gaza, Palestine. She lived in Kuwait until after the first Gulf War, when she moved to the US. Hedab holds a bachelor degree in Computer Software Engineering from University of Florida and an E-Business MBA from University of Phoenix.Hedab worked as an IM Program Manager at General Electric Energy for 20 years. She is now an IT Consultant and on her way to become a certified Financial Planner. Hedab has been active in the Muslim community in Southern California since 1994, working on building bridges and bringing people together. She served on the board of several non-profit organizations, including the New Horizon School Los Angeles. 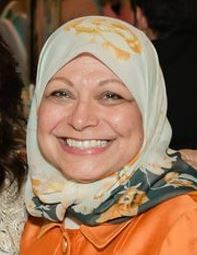 She was elected to be the first Chairwoman of both the Muslim Public Affairs Council in 2007 and the Islamic Center of Southern California in 2016. In 2002, she led the effort to make a quilt in remembrance of 9/11 victims. The quilt now resides in the 9/11 Memorial Museum. Hedab worked with KPCC, the Pasadena National Public Radio station on “Portrait of Hedab,” an audio diary reflecting on her experience and the Muslim community in Southern California after 9/11. The diary aired nationwide and won the Golden Mike Award for best documentary. Hedab works with humanitarian organizations focusing on elevating the suffering of Children in Palestine and the Middle East. She is currently serving her second year as the Chair of the Board of Directors of the Islamic Center of Southern California.